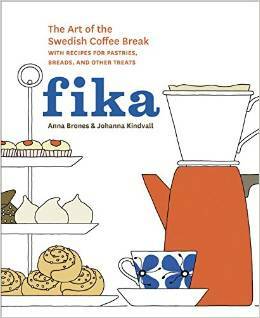 The one word that comes to mind every time I browse through the cookbook Fika by Anna Brones and Johanna Kindvall is "charming." Unlike many current books that have gorgeous photos, this one has drawings. While I usually love photos in books, I thought that the drawings in this book were sufficient, and it also allowed for a simple way to diagram some of the processes used for some of the recipes. Oh, and if you're wondering what the heck Fika means - it's a traditional Swedish twice-daily coffee break. While the book talks a bit about actual coffee (what kind of cup do YOU use?) it's really more about the foods that you serve with coffee - cookies, pastries, breads, cakes, sweets ... and more. Most of the recipes require ingredients that should be easy to find - or that are probably already in your pantry - like flour, butter, eggs, and sugar. One of the most challenging items might be the raw hazelnuts, since toasted and roasted seem more common. But even those shouldn't be hard to hunt down. Well, okay, maybe elderflowers might be harder to find. I have a feeling that's either something that grows like crazy where you are, or it's nowhere. But that's just one recipe, so it's not a dealbreaker if you can't find the flowers. Recipe titles in the book include the Swedish names as well as American translations. I was particularly smitten with Kinuskikaka, a caramel cake that with almonds. I want to make it, just so I can attempt to say it. On the other hand, the cake recipe looks really good, so that's also a reason it's on the to-do list. By the way, a lot of the recipes include nuts. Which is perfectly fine with me. And so far I found one recipe that uses nuts instead of flour, making the cake gluten-free. Besides the drawings making this book quirky, the order of the recipes is also a little ... odd. It makes sense to the authors, I'm sure, but from a cooking point of view, I found it a little ... odd. There's a description of why the recipes are in the sections - some are iconic, some are more modern, some are good for traveling, and others are good for a celebration. But that didn't stop me from wishing that the cookies were in one chapter, cakes were in another, and so on. Again, it's not a dealbreaker, just an oddity. If I really wanted to see just cookies, they're listed in the index. But from a browsing perspective, the flow didn't make as much sense to me as other books I've browsed. As usual, I'm working my way through some recipes so I can share one with you on Cookistry later. I'm pretty sure you'll love it.